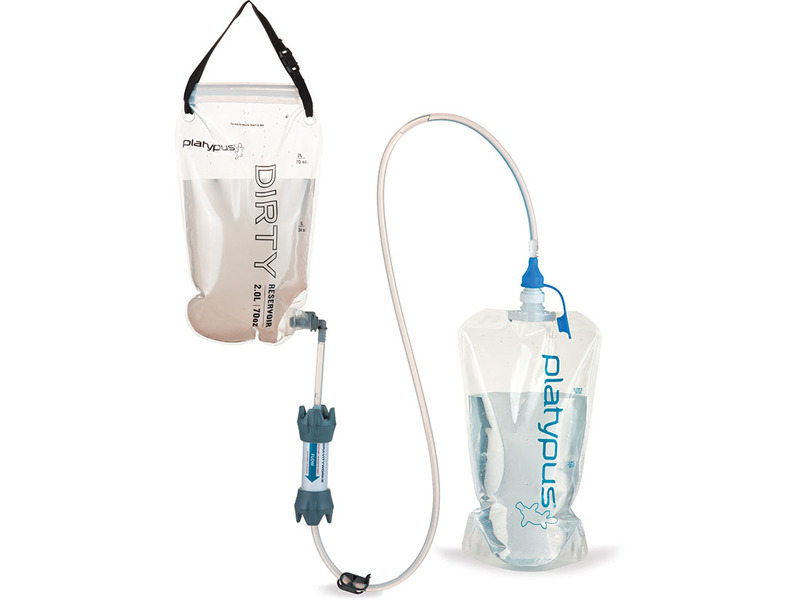 Ultralight, versatile pump-free water filtration for 2-4 people. Learn more. An ultralight and versatile water filter that makes it easy to treat water for 2-4 people on backpacking, hiking, and backcountry trips, the pump-free GravityWorks 2.0L Complete Kit filters up to 1.5 liters a minute. Plus, it comes with a complete range of adapters, and a high-capacity collapsible bottle, for easy tailoring of the system to meet different needs on different trips. No pumping: Just fill the dirty reservoir, hang it, and let gravity do the hard work—yep, filtering water can be as easy as fill, hang, relax. Fast: Filters up to 1.5 liters per minute; microfilter lifetime up to 1,500 liters of water. Effective: Every microfilter is individually tested to ensure it meets EPA & NSF guidelines for the removal of 99.9999% of bacteria and 99.9% of protozoa**. 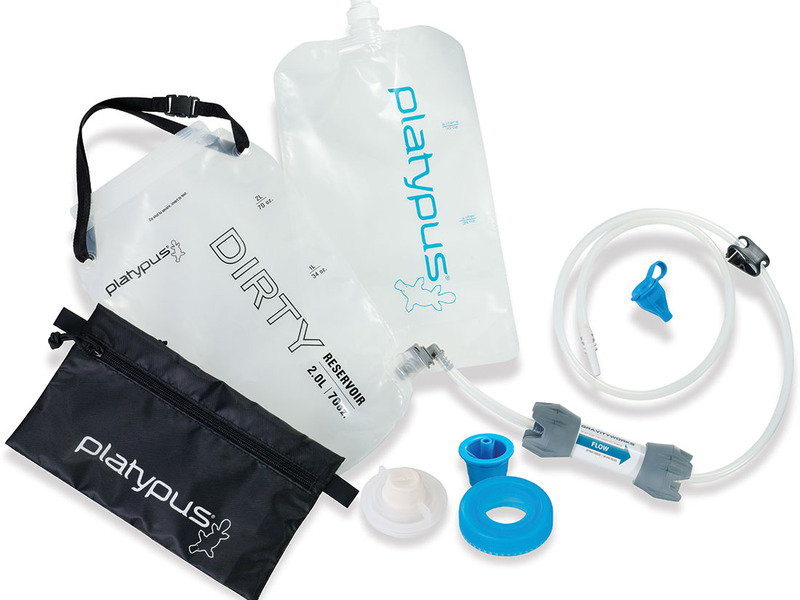 Comes with: 2.0L Platy™ bottle, 2.0L Dirty reservoir, Hollow Fiber microfilter, Universal Bottle Adapter, Push-Pull Cap Adapter, hoses, storage sack. **This includes Giardia, Cryptosporidium, E. coli, Salmonella and Cholera. Why is backflushing so important with the GravityWorks™ filter? Backflushing regularly maintains optimal performance of the filter cartridge. This is especially true when filtering murky or very silty water. Backflushing rinses out particulate that collects on the outside of the Hollow Fiber filter media. Infrequent backflushing makes it more difficult to restore the filter’s flow rate. Based on results from our in-house water lab, we recommend backflushing anywhere from every 8 liters to as often as after each use, depending on water quality. Our lab has found that the more you backflush, you can expect better maintenance of flow performance and longer life from your filter cartridge. Is it okay to filter tea-colored water? This color of water typically comes from a high concentration of decaying vegetation adjacent to, or in, a water source, resulting in a variety of organic acids. These acids, and the accompanying water conditions, are very hard on ALL types of water filters. Get your water elsewhere if you can. However, if no alternatives exist, we recommend backflushing/cleaning your filter after every use in the field. This will help minimize the impact of these impurities. Then, when you return home, add 2 drops of unscented household bleach to one liter of water and backflush this solution through the filter. This will help break up organics that might be clogging the filter and prepare your system for long-term storage. Note: extended use of tea-colored water can permanently impair Hollow Fiber filter media. Once you have used your GravityWorks™ filter and wet the Hollow Fiber filter media, the fibers will still be wet. Therefore, it is important to prevent it from freezing, which can permanently damage the filter media. If you are traveling in areas where you are expecting freezing or near freezing temperatures, bring the filter into your tent, or even your sleeping bag. (Be sure to put the filter in a water tight bag to prevent leaks in your sleeping bag.) If you think your filter may have been damaged by freezing, perform a Filter Test before the next use. For expedition-style travel where freezing temperatures are the norm, we recommend using the MSR® MiniWorks® filter. Its ceramic/carbon filtration media is better suited to such conditions. We don’t recommend removing the protective bumpers (GravityWorks) or removing the Filter Cartridge from the protective housing (CleanStream). The bumpers on the GravityWorks™ filter are designed to protect the Filter Cartridge from most drops, but direct drops onto cement and any drops above 5 feet (1.5m) should be avoided. If the Filter Cartridge itself is ever dropped after being wetted and outside the protective housing, you should replace it. If you think your filter may have been damaged from a drop, perform a Filter Test before the next use. Yes. Simply remove the bite valve on your hydration system and connect the end of the hose directly to your filtration system’s outflow port. Using a GravityWorks™ filter system, your reservoir can take the place of the supplied Clean reservoir, creating what is arguably the lightest, most compact and efficient way possible to get water. GravityWorks™ filters are available with direct-to-reservoir and direct-to-bottle adapters for optimum versatility. Can I get small replacement parts for the Quick Disconnect fittings on my GravityWorks™ Dirty Reservoir? Will the GravityWorks™ or Meta™ Bottle water filter remove unpleasant tastes? No. Hollow Fiber filter media does not remove tastes from water. However, the use or addition of an additional filter with carbon activated technology will absorb most of the unwanted tastes you may find in filtered backcountry water. For our GravityWorks systems, our Carbon Element accessory is available for those that prefer cleaner-tasting filtered water. How do I disinfect my Platypus filtration system? 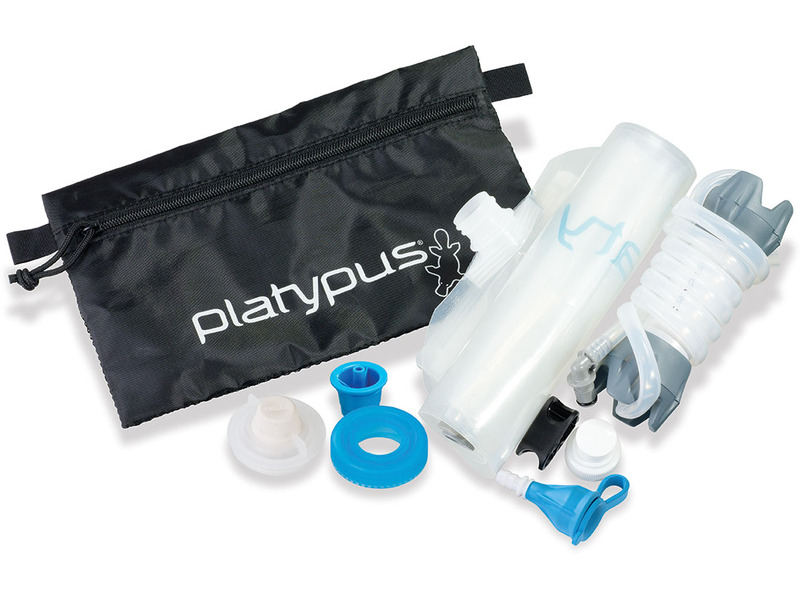 To disinfect your Platypus filtration system, fill it with a solution of unscented household bleach and water, using a concentration of 2-5 drops per liter of water. Close and swirl for 10 seconds. Leave filled overnight. Filter solution through any filters and/or hoses, then rinse system (including filters and hoses) three times with hot water. Let air dry. Why is “shake-to-clean” so important with the Meta™ Bottle filter? Cleaning regularly maintains optimal performance of the filter cartridge. This is especially true when filtering murky or very silty water. Cleaning dislodges particulate that collects on the outside of the Hollow Fiber filter media. Infrequent cleaning makes it more difficult to restore the filter’s flow rate. Based on results from our in-house water lab, we recommend cleaning anywhere from every 8 liters to as often as after each use, depending on water quality. Our lab has found that the more you clean a filter, you can expect better maintenance of flow performance and longer life from your filter. Are there any issues with using a GravityWorks™ or Meta™ Bottle filter in freezing conditions? A used GravityWorks™ or Meta™ Bottle filter will have wet Hollow Fiber filter media, which can freeze and break the fibers of the filter media (permanently damaging the filter). Therefore, it is important to prevent Hollow Fiber filters from freezing. If you think your filter may have been damaged by freezing, perform a filter integrity test before the next use (see instructions for your filter product). We recommend carrying a replacement filter as a backup in case of a failed integrity test. Do I need to do anything if my filter takes a hard drop? 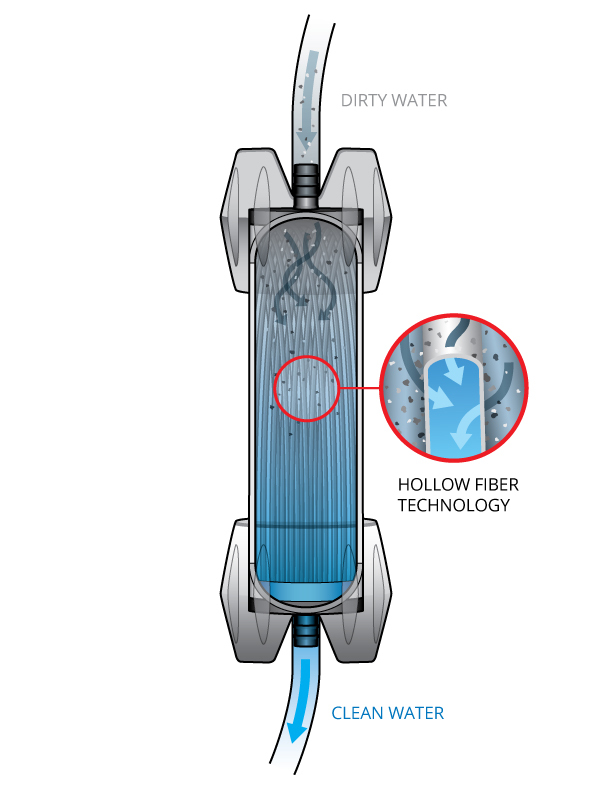 Hollow Fiber filters can be sensitive to hard drops. Any drops from heights over 5 feet (1.5 m) and direct drops onto cement or rocks should be avoided with GravityWorks™ and Meta™ Bottle filters. If you think your filter may have been damaged from a drop, perform a filter integrity test before the next use (see instructions for your filter product). We recommend carrying a replacement filter as a backup in case of a failed integrity test. Note: do not remove the protective bumpers on the GravityWorks filters. Yes there is! The Big Zip™ EVO Filter Connector Kit is a nifty accessory that allows you to filter directly from your GravityWorks™ into your Big Zip EVO without ever having to remove your reservoir from your pack. To do so, you first need to remove your drink tube from your reservoir via the quick-disconnect. Then, plug the connection point on the connector kit's hose directly into quick-disconnect point (you will hear a click). Next, attach the connector kit's hose to the base of your GravityWorks filter cartridge. Let gravity do the rest, as you're now on your way to clean, taste-free hydration. Watch this video for a step-by-step video instructing you how to use this product. Can I get small replacement parts for my filter products?